Jeremiah wasn’t the only one thrown into a pit. Remember young Joseph? His own brothers threw him into a pit eventually selling him into slavery where in Egypt he was sold again and at just the right time God pulled him out and he became the second most powerful man in the world at that time. God loves pulling his people out of pits! I know this to be true because like Jeremiah and Joseph he’s pulled me out more than once. Not only that there have been a couple of times in response to my rebellion when in order to get my attention and he caused me to fall in. And even now I am writing these words from the bottom of a pit and I am impatiently waiting for the hand of Jesus that will surely reach down and pull me out. 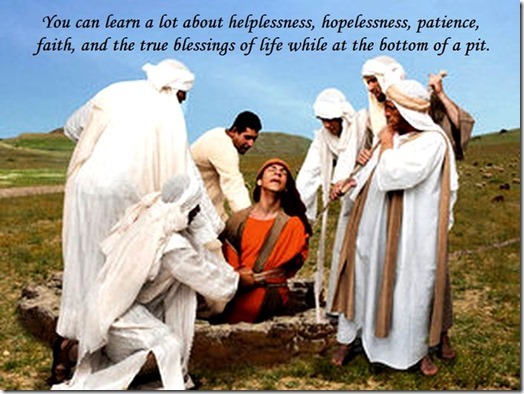 You can learn a lot about helplessness, hopelessness, patience, faith, and the true blessings of life while at the bottom of a pit. The trick is not focusing your attention on expending energy trying to climb out instead experiencing it as “class is in session time” and learning about life and how God wants to factor in to our lives. Steve Farrar in his book “God Built” hints at the fact that “bottom of the pit time” is time to open up our bibles, shore up, strengthen, and deepen our relationship with God.